The Piet Mondrian exhibition has opened at The Courtauld Gallery and it displaying works from the two years the abstract artist spent in the UK in the late 1930s collaborating with Ben Nicholson. It was an exciting time for both artists during which they pushed the boundaries of modern art to create their own concept of beauty. 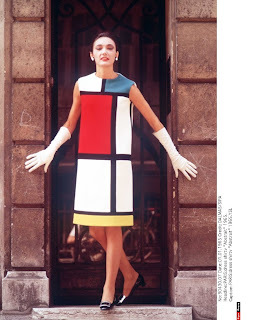 Yves Saint Laurent took huge inspiration from the artist and created the Mondrian dress in 1965 which has since become one of the most iconic mod dress and indeed graphically printed dresses of all time. Now on at Somerset House, The Strand, London. As New York is waving goodbye to perhaps some of the best catwalk shows in years, and London is in full flow of another long-awaited week, we are looking back at some of the best outfits! Oh wow!! Thumbs up for Dakota Fanning, who appeared absolutely dazzling at the Marc Jacob’s show - very much like a mermaid (another huge trend), that mesmerizes any passing sailor, Dakota made it almost impossible to pay attention to the walking collection on the actual catwalk. We are so ready for spring and with wonderful trends like the all over print, the bold floral and the Great Gatsby there is a lot for us to talk about. Our favourite dress from the new collection has to be this fabulous pleated 1940s style tea dress in colour popping floral print. It is super flattering and looks the business dressed up with a wide belt and lots of gold bling. Roll on sunshine!